Doctor Who Dalek to Victory 3-Inch Magnet:Give your refrigerator a healthy dose of the Doctor with the Doctor Who Dalek to Victory 3-Inch Magnet! The magnet measures 3-inches long x 2-inches wide. 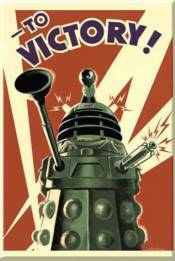 The fun Doctor Who Dalek to Victory 3-Inch Magnet is red and features a propaganda style graphic of a Dalek with the words, "To Victory!" Ages 12 and up.